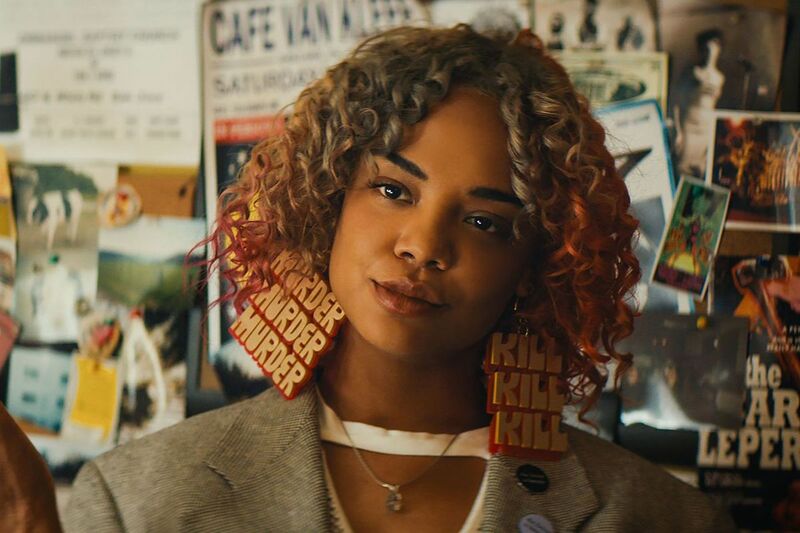 Tessa Thompson's earrings in Sorry to Bother You. In rapper Boots Riley's outrageously entertaining comedy about telemarketing, race, and exploitation of workers (which features music by Riley's rap band the Coup and Oakland songwriter Tune-Yards), the visual artist named Detroit played by Creed and Westworld actress Tessa Thompson sports super-cool, oversized earrings that spell out song lyrics. Among them are lines from the Coup's "The Magic Clap," Prince's "Partyup," and Bob Dylan's protest song "The Lonesome Death Of Hattie Carroll." Swearin', "Grow into a Ghost." Punky Philly indie band Swearin' last put out a record in 2013, when leaders Allison Crutchfield and Kyle Gilbride were still romantically involved. Now the duo have gotten back together musically, and are signed the Merge label, which is also home to Crutchfield (who now lives in Los Angeles) as a solo artist and her twin sister, Katie, who records as Waxahatchee (whose Great Thunder EP is due in September). Swearin's upcoming album is called Fall into the Sun, it's due Oct. 5 and the band plays the First Unitarian Church on Oct. 10. Olivia Chaney. British folk singer and harmonium player Chaney teamed with the Decemberists on last year's Offa Rex trad-folk project. The vocalist who recalls much loved Fairport Convention singer Sandy Denny has just released Shelter, her starkly beautiful second album, which features production by Thomas Bartlett (who has worked with St. Vincent and Florence Welch, among others) and a creative take on Tex Ritter's "Long Time Gone." Wednesday at World Cafe Live Upstairs. George Clinton & Parliament Funkadelic. The recent profile of genius bandleader George Clinton in The New Yorker let the world in on the little secret. Though the 77-year-old Clinton now plays small venues, no longer dyes his hair crazy colors and most of his best-known musicians are either dead or long gone from the band, the funk is still very much alive in the hands of a younger generation of players that still conjure up a groove so high you can't get over it, so low you can't get under it. Thursday at Ardmore Music Hall. Erykah Badu & Talib Kweli. The last time Erykah Badu was supposed to play the Dell on a Thursday — in the summer of 2015 — she didn't show up until Friday. But the show the Dallas, Texas, sui generis funkstress did put on when she showed up a day late in a Gil Scott Heron "Revolution Will Not Be Televised" poncho left few concertgoers disappointed. She's so good that it's hard to stay mad at Badu. This time through, she's also got conscious rapper Talib Kweli on the bill. Thursday at the Dell Music Center.